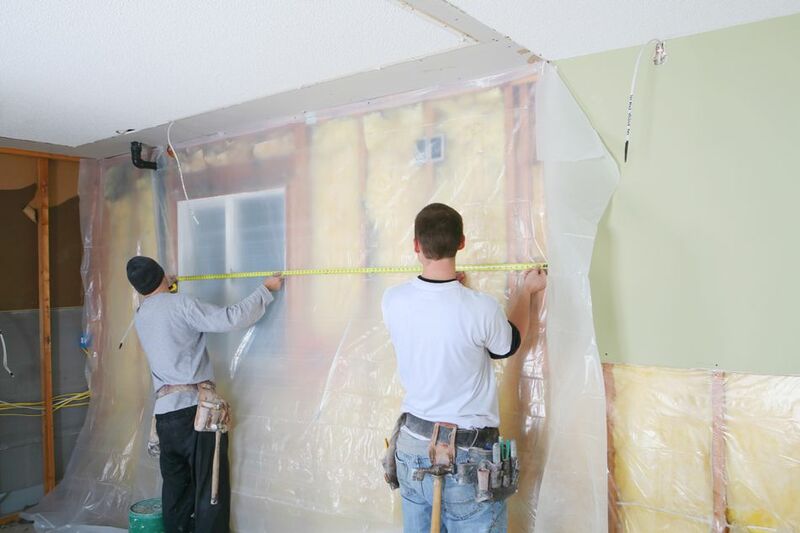 Here are some professional tips and recommendations on how to hang drywall. This step-by-step tutorial on how to hang drywall like a pro takes just 6 steps. The first step to hanging drywall is to take a pencil and mark on the floor and ceiling the placement of the vertical studs. Now that you have the layout ready, start hanging drywall at a corner and move towards the center of the wall. This is the preferred way to hang drywall and to waste less material. Hang the piece on the top of the wall first. Place the drywall against the wall and push it against the corner of the studs. All pieces of drywall must begin and end on a stud so they can be properly anchored. Sometimes you will need to score the drywall panel in order to attach it to the stud. Attach the drywall to the studs. Drive some screws on the end and along the center to hold the sheet in place. You can use a foot lift if needed to secure it in place. Screws should be driven far enough to ‘dimple’ the surface of the drywall and make sure at least 5 screws are used along the drywall edge. Do not to break the paper. If you opt to use 1/2 inch drywall, be sure to use 1 1/2 inch long nails or screws. For a 3/4 inch drywall, use a 1 3/8 inch screw. Drive screws at least 1/2 inch away from the drywall edge. It is recommended if the edge joint of the drywall is offset by 4 feet from the previously installed one. Measure the distance between the first drywall installed and the end of the wall. Depending on the distance you must either install another drywall sheet or cut a piece of drywall. The best way to cut the drywall is to score the sheet with a utility knife. Repeat, as needed until the cut is deep enough that can allow you to snap the drywall along the cut. Using a colored chalk to mark electrical outlets and switches locations. Use the chalk to color along the metal edges of the outlet boxes, and push firmly the piece of drywall against the exact location where it should be installed. The drywall will receive the mark of the chalk that was rubbed against the outlet box, identifying the exact location in the drywall where the cut should be done. Do not forget to push the exterior face of the drywall against the outlet so you will easily notice where the outlet is located. Sometimes, a little extra pressure is required to make sure the chalk gets transferred to the drywall sheet. Hang the drywall and use a router cutting tool to cut the drywall. Many home improvement stores sell markers helping reliable marking of outlets and switch boxes. You can also measure the height of the outlet and transfer that measurement into the drywall. Hang the drywall over windows and door openings. Using an electric rotary saw, cut drywall around windows and door openings, but be sure that the drywall has being installed with all required screws around the window and door opening to minimize movement of the drywall sheet. When possible, do not create a joint at the door or window corner as this can minimize the possibility of cracks along the joints. Now that top drywall pieces have been installed, the bottom pieces could also be fastened to the studs. Standard interior heights are ½” over 8 feet, the standard drywall measure. If two drywall sheets have been installed, leave the ½’ gap to the bottom portion, so it can be covered by baseboard trim. That 1/2 inch space provides room for expansion and movement of the drywall without damaging the sheet. without damaging the sheet. Remember to hang drywall in such way that seams are staggered with the upper drywall seams. If you start the top row with a full sheet, then start the row below it with half a sheet and move on. Repeat the procedure for outlets, windows and doors openings.